Kent's "Hooligan Libertarian" Blog: How do you see reality? Reality isn't relative to perception. It is what it is. They live in paper and guns faux world prison camp. ...although it doesn't really exist, they create it, like a fun park where they gobble up land, claim your neighborhood and force you to pay admission to the roller coaster in your back yard. You don't have to ride it, of course. You do have to pay admission though, and are required to purchase at least one meal from the concession facilities daily, or be murdered by security staff. Move if you don't like it. "Move if you don't like it." I'm told Somalia would be a good fit. Told over, and over, and over again. I've heard it a few times myself, ...over and over again. 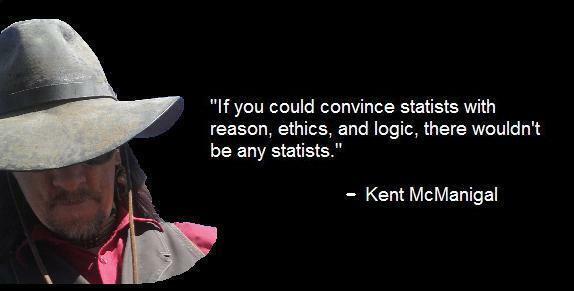 You can't reason with statists. You just have to kill them all. It's not possible to kill an idea- and statism is an idea. Even if you kill every statist, others who weren't statists may develop the idea (even ignoring the fact that "kill them all" is THE statist idea) by exposure to your example. If you kill everyone (again, probably not possible due to genetic diversity etc.) then you've also killed off libertarianism and any possibility of a free society. You've also expressed a desire to destroy the Universe (again, not possible). That's anti-libertarian, too. I sympathize with your frustration, and sometimes wonder if a free society could ever be possible, since it is obvious to me that statists won't "allow" it, and mass killing couldn't bring it about. You've definitely made me think. It is principally no different than running off a gang of bullies in a playground. And it could be done. A small army could effectively kill almost everyone on Earth on about a year or so. The problem I have with killing almost everyone is that it is indiscriminate. I have difficulty justifying killing innocents. So what's stopping them? There are many armies, small to large, and yet here we are. It's not their consciences stopping them. So what is? Would that also stop a small army seeking to kill all statists? You'll have to ask them. But it could be done, if done properly. You would have to produce nasty contagious deadly bio-weapons and start a pandemic, but it could be done. A pandemic wouldn't kill everyone (due to the aforementioned genetic diversity), and it wouldn't discriminate between statists and non-statists. You might end up with a worse spread than before. If you had the proper weapons and properly distributed them you could kill many billions. You would have to produce several different deadly and contagious weapons and release them in thousands of locations globally and simultaneously in order to start a pandemic. Ideally, you would release them onto currency, in transportation hubs, schools, factories, anywhere it can spread or there is foot traffic and people going different directions. There are so many ways to do it. But the idea is that if you set it all up and released it everywhere within a small time frame, you could effectively kill billions. Perhaps not everyone initially(more like a couple billion), but in time could kill more. Keep in mind that this is just a thought exercise. It isn't like it's really going to happen like that. But it is possible. I was kind of hoping a big space rock shedding a nasty shower of debris could wipe a few billion out. Something needs to bust this global cage apart.